Invisalign takes a novel approach to straightening teeth, by using a series of custom-made removable trays to help you achieve a confident smile without the use of traditional brackets and wires. 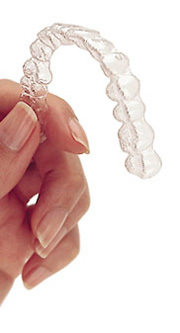 The aligner trays are made of smooth, comfortable and virtually invisible plastic. Wearing these aligners over your teeth full time, will gradually and gently shift your teeth into place, based on the exact movements prescribed by your dentist.